Wow! We have reached the final day of Just Jingle Giveaway Week! This has been AWESOME! Thank you so much for your support! 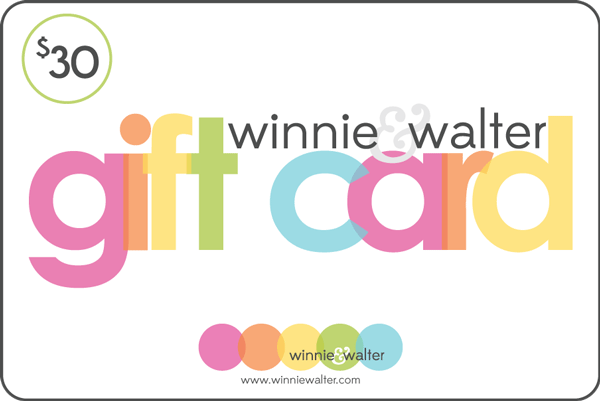 Today's first giveaway is from none other than the super fabulous Winnie & Walter!!! If you haven't yet tried Winnie & Walter stamps you are in for a treat! They have SUCH great designs! They are offering one lucky winner a $30 Gift Certificate to their store! WHAT?! Yup. Totally. Here is a card I created using a fabulous Winnie & Walter stamp set not too long ago. First comment! Woot! Love Winnie & Walter's Big Bold series of stamps. You could help me buy that wishlist I've got goin, Jingle. Just sayin'. VERY COOL how you added the watercolor... i love those sentiments..the script is awesome..
Whoa. Wicked wonderful Winnie and Walter winnings. Want! Cool card--craving colorful card stock creations!! LOVE the card with the watercolor section and the fabulous sentiment! Great font... I'll definitely be checkin' out Winnie & Walter! Awesome prize! What a great card! Another Factoid for Saturday a.m. Michigan has more shoreline than any other state except Alaska. Wow, I am learning about so many new stamp companies this week! Cute card! Ditto Cheryl. Haven't heard of this company either. I'm not a one trick pony, so hey, I can share the stampy love! Lovely watercolor cas card. Thanks Jingle. Bonus day too cause I thought Fri was the last day. Woo hoo! Looove W&W! Their new release has me wanting lots more too. I'm sure I could spend that GC in a heartbeat, lol!!! Love this card! Such pretty wash of colors in the background! Now I need to break out my W&W set and get on working! :D love the card btw! (I actually love all cards made with W&W! I so love your watercoloring and those tiny flowers are awesome.....I can think of 100's of uses. Never heard of Winner and Walter----off to check out their FB page now! This is another "new to me" store that I haven't been to....you are killing my wallet!!!!! But I love ya for it. Love the w&w stamps! Glad I found your blog! Hold on. Say what?!? A 30$ GC to Winnie & Walter?! !...How AWESOME is that?!! LOVE Winnie & Walter designs, LOVE that they have "real" and digital collections!!! Shay fromW&W sent me over...boy is she ever having fun at the SSS CREATE shindig! congrats on the FB monument. Fantastic card I like the watercolor. Thanks for the chance to win. EEEK!!! Say what, $30!! I love this card!! Live your watercolor block - I need to try that! LOOOOOOOOVE W&W's stamps! How on earth did you glue those teensy SSS flower sequins down???? Sweet card. Thanks, Jennifer, for the chance at all the goodies you've been displaying! W&W stamps - swoon!!!! Totally classic! I love your card still, too!! Such an awesome week on your blog! THIS makes ME happy! the watercolored bit of background is awesome! W&W stamps always catch my eye! thanks for another chance to win. Sharing is caring....and you are going over the TOP this week. love it! your card is awesome and so colorful!Thank you all for your heartfelt welcome to your stamping family ;0)that make me so proud. Pretty background to your card. fun to find new companies that you haven't heard of before. Your card is pretty. I have to try some of the watercolor effects. thanks for having this week-long contest. It's been fun, informative, and inspirational. Winnie &Walter.......I love your stamps! Love the card, and thanks again for another chance to win! Love your artsy card, very pretty background. I've had just as much fun as you with this weeks giveaways, all cool prizes. Thanks! I have never tried Winnie and Walter stamps, I would love to the sentiments look amazing! I LOVE W&W! So, your card = fabulous. I remember seeing it earlier...where are those sweet stars from and what are they made of? Winnie & Walter's bold sentiment stamps are the best, love how they take center stage on a card. Oh - I LOVE Winnie and Walter stamps! The Big and the Bold are awesome!!! LOVE, LOVE, LOVE this card, and Winnie and Walter too! TFS!!! Just love this new company...the large sentiment looks so neat against your blue square background. Another great card...loving the water coloring! Thanks for sharing all your favorite companies! Happy Saturday!!! Love the soft watercolor background and the little sequins. You are really inspiring me to break out the watercolors and see what I can do. That would be gone faster than you could say "just jingle". So many fun goodies at W&W. I must confess, W&W has to be my favorite new company EVER. I have several stamp sets and the CUT files. HOLY CROW. They are phenomenal (have I mentioned I love Ali Edwards instructions to create cuts for the Silhousette from the .png's). The Big & Bold ..... all I got is WOW. Keep em comin'. WOOT! I love W&W! Awesome card! I seriously LOVE Winnie & Walter- those awesome sentiments and that handwriting font make me swoon! WOW you did it again with the beautiful watercolors. LOVE your background. Thanks for the chance to win some fun goodies. What a fabulous font on that happy! I bet even Replicators could not do better. couldn't be better, love the watercolor! Did you know da Vinci's The Last Supper started to deteriorate almost immediately because he liked to experiment with how he made his paints? There were "recipes" for paints, but he didn't always use them. Dude! why?! That happy stamp is calling my name. Although I like the delightful water color effects on your cute card, that is not what I want that stamp for. Can you hear my heat gun starting up? Now if I can just find the right embossing powder ... oh there it is ... OK. Ready to win now. I just love Winnie and Walter's large sentiments. I love to watercolor and their big bold words are just the perfect way to balance out they layout. This company has some great looking stamps. I love the sets with all the different words. How exciting and fun...love their stamp sets and have a super long wish list that this would help buy. You sure do know how to celebrate!! Fabulous card!!! Wow nice giveaway! They are on my wish list too! I really need to win the lottery!! Congratulations Jingle! Love your card! Now my creativity won't falter!!! W&W stamps are AWESOME! Their "The Big, the Bold" series is one of my FAVS! 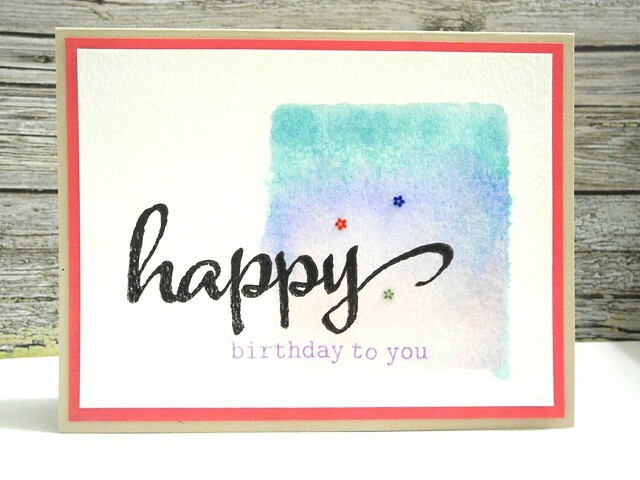 Love the water color on your card! This is my fav trend! okay I'm LOVING that water color look--GREAT card!! I love all these new stamp companies popping up with their own unique designs and style. I have all of Winnie & Walter's Big & Bold series. So well designed and they stamp beautifully! Your card is a great way to showcase those large sentiments with pretty much any colors you choose. Big fan of W&W, so glad they are here and filling a void that has been missing in the scrap booking/card making world! Thanks!! I don't do fun comments. I can do weird and socially awkward though. :) And I hope you don't find this too boring but I liked your card. Thanks for sharing. I got here via the W&W blog in case your care. And if you were to pick me, well then you would have picked me and I would get to use the stamp set which would be nice. Glad to have stumbled across your blog. Stamps looks like it would be so much fun to play with. W&W is awesome...love their sentiment sets! I adore this watery bg...and those teeny sequins are the bomb! Love W&W's big scripty sentiments...they do everything right! Happy to make your acquaintance Jingle, thanks to Winnie and Walter's introduction! It looks like you have been having a fun week, I plan to take a peek! I just saw a "Hey, Dude, Hey, Girl" card on their website that cracked me up. Love the simplicity of your card. I really love the font used for the word "happy." So pretty! Great card! Just discovered the Winnie & Walter stamp and I can't wait to get some of them! Love the big words matched with the little! I have been a big fan of W&W stamps, just haven't had a chance to get any yet so this is fabulous!! Love the big block stamping you did to create that fabulous watercolored background. I have a very long list of W&W needs, so this would help immensely, kthx bye. Ha! Just kidding, but seriously, way to roll out the awesome giveaways this week! Wow, I've never even seen this stamp manufacturer but I'm already in love with their sets! The geometrics, the fun sentiments and especially the sequin and confetti sets make me shiver with delight! Happy Giveaway Day to you!! I appreciate all your postings - the exposure to the different techniques and products is very inspiring - thank you! Winnie & Walter stamps are on my wish list - they have such great fonts! How is it that I've missed this stamp company all this time?? Good grief but there are some awesome sets here! I've been into fun fonts and sentiments lately so you know that I'm drooling! What a killer giveaway week! Love your watercolor card! SO perfect! Oh my....those are some of the most fabulous stamp sets I've seen in a long time! Winning this would be both a blessing and a curse because how in the world would I choose between them all!! LOVE! Hi Jingle! Congratulations. I'm here from Shay from W&W. I've been following her journey at Simon Says Stamps on Instagram and am drooling over her posts! Would love to try W&W stamps. Thanks for the great giveaways! Love the calligraphy on the Winnie & Walter Big and Bold series! Your card is wonderful and good luck with Gallery Idol! Wow great card!! I have never heard of Winnie & Walter stamps. I must check them out. Thanks for the chance to win! I love the calligraphy . Never heard of Whinnie, but am very interested to see what they have to offer. I might like it...on the other hand my wallet and my husband might not. W&W has so many awesome stamps like this one. I think I need to go ink mine up now. :) Thanks for the inspiration and the chance to win. LOVE the Winnie and Walter Big, Bold series - the script words are the best! Are you just completely exhausted after this giveaway week?!? You lined up some great giveaways! LOVE this Winnie & Walter one though!! I don't any of theirs yet, but would love to win! Winnie and Walter is a new stamp company but is on the top of my list :)Love their stamps. Tour card is awesome as always ! I would Love to Winnie me some Winnie & Walter! Their stuff is Just Jingle great! This is so pretty! I love the watercoloring! Winnie and Walter is a new company to me. They have such cute things. I see some stamp shopping in my future!! I have heard of Winnie and Walter. in fact, I was looking for this very stamps set at SSSCreate this past weekend. Of course it was sold out. I have found a new love for watercoloring. Who Knew? Your card is great. I really really really really want to roast marshmallows... ever since we switched to a gas grill, I haven't been able to get my mallow on! ugh! Wow I love your Cards I have just had a wander around your Blog! See you again soon! I just happened upon your blog through Winnie & Walter and am excited to meet you! Rock on!!! I love the big bold sentiments from W&W! This is just simply cool! Love the color combo with bold sentiment from W&W! Just WOW! Beautiful card!! Winnie & Walter stamps? All I have to say is their stamps are definitely Big, Bold, and awesome!! Who doesn't love their stamps?! How am I only now finding out about this fantastic company?!! Oooo I love this card! I haven't tried them before!! I love discovering new stamp companies--the hubs, not so much haha ;) Winnie & Walter--c'mon, just the name alone makes me wanna buy their stuff!